Qt open governance will go live! Posted on September 12, 2011 By Christoph CullmannNo Comments on Qt open governance will go live! Thanks for all the effort to all people who made this possible! 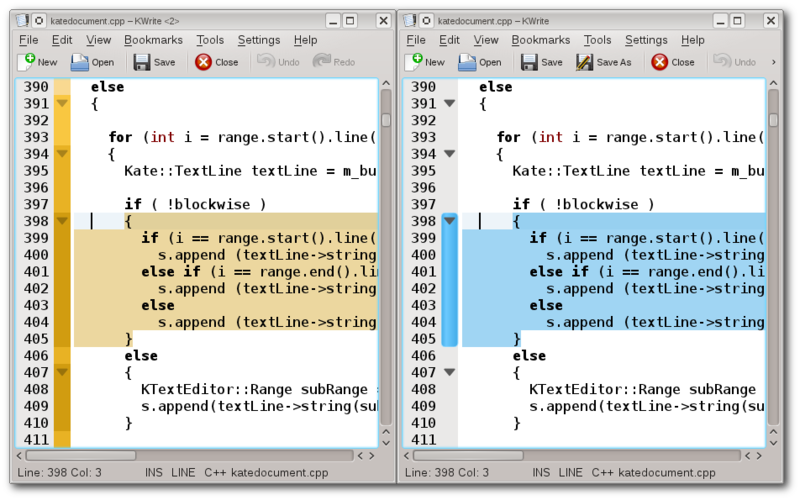 Christoph and me cleaned up the visualization of the code folding for KDE 4.8 a bit. In the snapshot, the left image shows the old behavior, and the right one shows the new behavior. The background highlighting appears as soon as you hover over the code folding bar. We hope you like it :) Mockups of how to make it even better are welcome, of course! You can try it by building Kate yourself, if you want. Some days ago, Dominik implemented a line modification system in the KatePart. For all who don’t know what that means at all (like me before the DS 2011), here some screenshots. First I thought: Why to hell do I need such a feature? But after using it some days now, I think it is really VERY useful. Yesterday I worked in parallel on code that generates integer linear programs as CPLEX files and read the output files (which are > 100000 lines) to find regressions. I had to manually tweak the ILP files a bit to reveal the reason of my issues and it was just cool to exactly know even after save, which lines in the ILP I touched. Oh, I just tweaked that few C++ lines and it did remove the issue, maybe I should look at the lines below/above of that lines, too, for more possible problems? Therefor: Thanks to Dominik for this nifty feature, I hope others appreciate it, too! If you want this feature now: Use the guide at kate-editor.org’s Get It!.